This active family trip allows you to explore the islands at your own pace. Zip-line through a cloud forest, hang out with sea lions on remote beaches, have a surf lesson, snorkel with friendly sharks, and meet local Galapagos residents. Enjoy the Galapagos with the kids in a way that nobody in the family will be bored. See below for availability and a trip itinerary. People who like our Galapagos family adventure may also like our Galapagos multisport adventure tour. Quito, Ecuador, is a spectacular city positioned just a few miles shy of the equator in a narrow valley surrounded by volcanoes. At 9,350 feet above sea level, it is the second highest capital city in Latin America, and maintains a pleasant spring-like climate all year round. Quito is also the cultural epicenter of Ecuador, with a plethora of museums, expansive outdoor parks, and colorful festivals and fairs. Upon evening arrival into Quito’s Mariscal Sucre International Airport, you will be met by Andean Discovery staff and transferred to your hotel, perched on the crater rim of the dormant Pululahua Volcano. Meet up with your guide this morning and travel by private vehicle to the famous cloud forests of Mindo. Watch the scenery transform as you descend the high slopes of the Andes into the lush green forests below, keeping an eye out for waterfalls and cascades along the way. Located in one of the most biodiverse regions in the world, Mindo is home to over 300 different species of tropical birds–including toucans, quetzals, owls, and hummingbirds–and countless other plant and animal species. Catch a birds-eye-view of it all during a thrilling canopy zip-line tour, a series of 13 platforms and lines spanning over two miles across the upper levels of the forest. After lunch, travel to zero degrees latitude and visit the Mitad del Mundo equatorial monument. Stand with one foot in each hemisphere and test out the effect of gravity on the equator through a series of interactive experiments. For example, is it possible balance an egg on the equator? Go for a hike in the Pululahua Geobotanical Reserve and learn how small farms subsist from the fertile lands of the volcano floor. Enjoy dinner with your guide and a briefing about the upcoming Galapagos excursion. This morning you will be transferred to the airport in time for your mid-morning flight to Baltra Island, Galapagos. 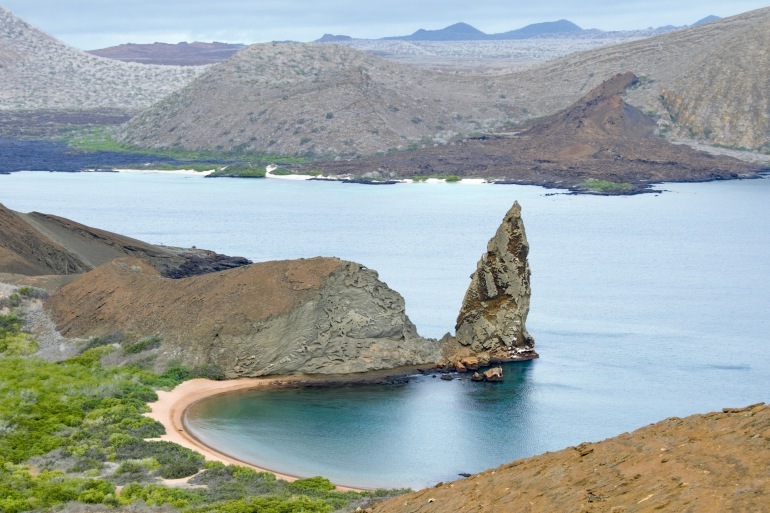 Upon arrival in the Galapagos, you will meet your Naturalist Guide and travel to Santa Cruz Island. This afternoon explore the highlands of Santa Cruz. As you ascend, you will travel through several different vegetation zones and witness the landscape become increasingly lush and green by the minute. Here you’ll have the opportunity to view the islands’ most famous reptile: giant Galapagos tortoises in their wild habitat. It’s a real treat to see an endangered species roving in this lush environment! The vegetation of the area includes the Scalesia forest (an endemic giant daisy tree). Birds such as the vermilion flycatcher will delight everyone with its scarlet feathers against an emerald green forest. Look for Darwin’s finches (most of them from the tree-finch group), particularly the famous Woodpecker Finch. Explore an amazing network of lava tubes, underground tunnels formed by hot liquid rock. The outer part of the tunnels hardened and cooled even as the interior lava continued to flow. Eventually, the flowing interior lava emptied out, leaving hollow cave-like structures. Sample some of the local cuisine and board our speedboat for the two-hour journey to Isabela Island. Check in at your beachfront eco-lodge and finish the day with a refreshing swim in turquoise waters as the sun sets on the horizon. This morning travel 13 miles inland to the island’s highlands, where you’ll discover Sierra Negra, one of the largest volcano craters in the world, measuring 6 miles in diameter and 1,000 feet deep. Steaming fumaroles and the charcoal-black landscape are proof of its ongoing volcanic activity. Hike around the crater rim to see lava remains from the 2005 eruption. Opt to extend your hike and visit Chico Volcano, a neighboring crater with lunar-like landscapes, including various formations of petrified lava. This afternoon cool off with a surf lesson from a local Galapagos surfer and see the islands from a different perspective. The Galapagos archipelago is a world-class surfing destination, and with its beautiful beach break, Isabela is the perfect place to learn. After breakfast, board a dingy with your guide and travel across the bay to Tintoreras Island, a resting place for white-tip reef sharks. En route you may see Galapagos Penguins, which seem comically out of place so close to the equator. Once ashore, a short hike reveals the largest colonies of marine iguanas in the Galapagos, sea lions, Sally Lightfoot Crabs, and Blue-footed Boobies. Return to the bay for a snorkel—look for sea lions, rays, and many different species of tropical fish. This afternoon hop on a mountain bike to explore Los Humedales, a series of coastal pools, lagoons, and endemic mangroves that boast an abundance of birds and native plants. Keep your eyes out for herons, Black-necked Stilts, and Galapagos pintails, and be careful for Marine Iguanas crossing the road. Then make your way to the Wall of Tears, the remains of an old penal colony, and learn about the human history of the Galapagos. Continue by bike to the home of a local Galapagos family for a special visit. Roll up your sleeves and learn how to cook a traditional meal, including fresh seafood and other native treats. Enjoy the meal with your hosts who will share personal stories about life on the island. This morning depart by boat for Puerto Ayora, Santa Cruz Island, the largest port town in the Galapagos. Enjoy some free time on your own before lunch. This afternoon visit Garrapatero beach, where it is possible to explore the coast by sit-on-top kayaks and observe wildlife such as brown pelicans, flamingos, lava lizards, and lava gulls. This morning we hike 45 minutes through a dry coastal forest and white sand beach to Tortuga Bay, a secluded cove surrounded by mangrove forests. Keep your eyes out for shore birds like Whimbrels, Ruddy Turnstones, Great Blue Herons and endemic Lava Gulls. This afternoon opt for a guided visit of the Charles Darwin Research Station, where you will learn about current scientific research on the islands and the Station’s mission to ensure the conservation of the environment and biodiversity in the Galapagos Archipelago. The Station is also a tortoise breeding and rearing center. Observe how tortoises of different subspecies are prepared for reintroduction to their natural habitats. Or enjoy some time on your own for shopping in Puerto Ayora and to wander around the port town. This morning transfer to the airport in Baltra Island in time for your morning flight to Quito, with connection in Guayaquil. Stop along the way to view the breathtaking Twin Craters, formed by the collapse of surface material in underground fissures and chambers. Upon arrival in Quito, you will be met by your Andean Discovery guide and driver and transferred to your hotel, conveniently located in a rual village near the airport. A light lunch/snack is served on the plane. This morning you will be transferred to the airport in time for your international flight. The Mercure Quito is located in the lively Mariscal district near shops and restaurants. Each of the hotel's 147 large and modern rooms features Wi-Fi, safe deposit box, mini-bar, bathrobe, and slippers. Hotel amenities include a fitness centre, restaurant, and bar. Located in the small village of Puerto Villamil, La Casa de Marita is a charming, boutique hotel situated along a stunning white sand beach. Amenities include air conditioning, a restaurant, large patio with hammocks and lawn chairs, and laundry service. Centrally located in the town of Puerto Ayora, Hotel Sol y Mar overlooks Academy Bay with views of the ocean. Galapagos tourism pioneer Jimmy Perez opened the hotel in 1960 with eight rooms. In 2007 the hotel was completely renovated and capacity was increased. Amenities include air conditioning, restaurant, Jacuzzi, pool, bar, and open air patio.